Labouring, but not really knowing how to achieve that finesse of rendering, Fuchs developed a technique that approximated Dali's. Still, his desire to learn the secrets of Old Masters urged him on to meet the elder artist in person. By 1951, Fuchs was in Paris. At La Hune bookshop, he saw a poster announcing a Dali exhibition at Raymond Weil's gallery. His chance to meet the master in person had arrived. 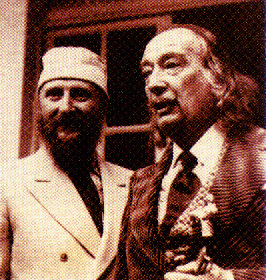 He went round to the gallery and, as chance would have it, Dali himself was visiting Weil in his office. The unknown Fuchs was introduced, and a portfolio of his works produced. "I show you my paintings," he said, grasping for words in English. Fascinated by painting methods, Dali himself later came round to Fuchs' studio to see him at work. Unfortunately, Fuchs' 'studio' at that time was an extremely small chambre de bonne (former maid's quarters) six flights up, with no lift. And, as was his habit by now, while he painted, Fuchs also tended to the baby wrapped in an old sleeping bag and suspended near the easel - his baby son Michael Fuchs. Hence the movement, of one post-war generation to the next, from Surrealism to Fantastic Realism. And hence the re-interpretation, from one generation to the next, of art's endless enigmas.